English dissenting minister, educator, and author; born at Truro in 1771 and educated in the city of his birth by Dr. Cardue. He conducted a private school at Hackney, near London, for thirty years, and died at that suburb on June 17, 1839. He is best known by his "Modern Judaism; or a Brief Account of the Opinions, Traditions, Rites, and Ceremonies of the Jews in Modern Times" (London, 1816); that is, since the common era. This work has been commended by no less an authority on religious subjects than Edward Bickersteth, the English divine, for its "useful information." William Orme, a contemporary, characterized it as "the best work on modern Judaism in the English language"; and Thomas Hartwell Horne, an English bibliographer, referring to it said: "In this well-executed volume the various traditions received and adopted by modern Jews, that is, by those who lived in, and subsequent to, the time of Jesus Christ, are fully and perspicuously treated." The book was reprinted in 1830. 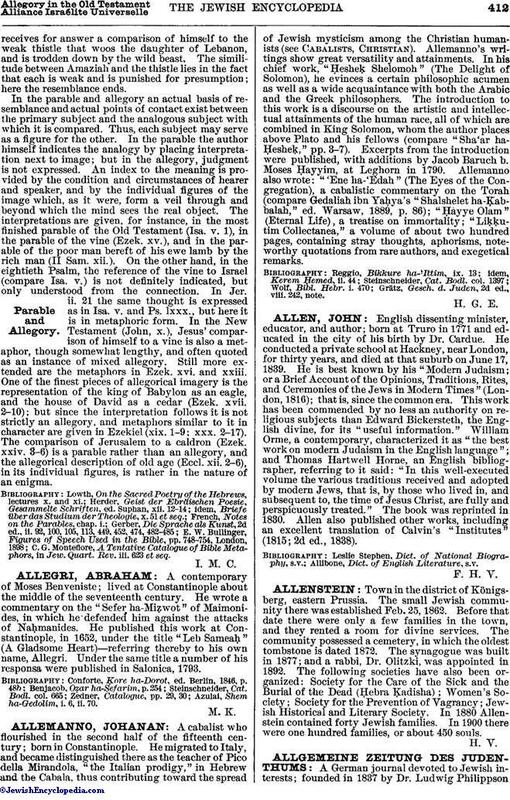 Allen also published other works, including an excellent translation of Calvin's "Institutes" (1815; 2d ed., 1838). Allibone, Dict. of English Literature, s.v.